Southern NB Featuring St.Andrews By The Sea! SEE THE SOLD SIGN SOONER! Garage: Single, Detached "Quonset Hut"
WOW! What an extraordinary property with a beautiful Easy –To-LOVE Home. 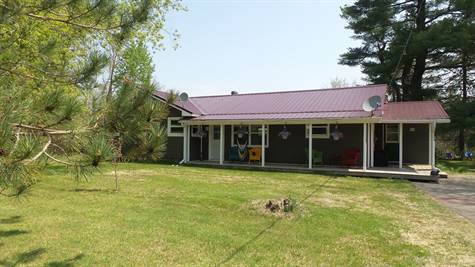 Comprised of 100 acres (+/-) a private beach you can 4-wheeler to & drop your canoe & river frontage on the Magaguadavic River.. The possibilities are endless here! The covered front porch is a fav place to enjoy your morning coffee or a quick nap in a hammock perhaps? Stepping into a mudrm before entering the spacious eat-in kitchen creates a great flow of rooms & appliances included too! Extend your dining experience onto the spacious back deck complete with pool for those Summer Lovin’ Kinda Days! Oversized & ready for all your cozy furniture is the living rm with gleaming hardwd floors. Two steps up boasts 3 bedrms & an “Oh Soo Dreamy” spa inspired full bath with corner soaker tub & a separate shower. A convenient laundry shoot makes carrying laundry downstairs a thing of the past. An “open to your ideas” full basement awaits with a heat pump & laundry area already in place. No stressing about storage with a 28x40 Quonset hut, it won’t be easy to fill! This paradise would make the perfect home or home away from home. Start here, vacation here or retire here…YOU decide.